The post lists several movies as examples, but doesn’t mention several key genres that raised the “Heroic Outsider” to the mythic status of true American Hero. What of superheroes like Batman and Superman or crime fighters like The Untouchables? What of the genre I grew up on, the western? While Googling for westerns with the classic, “clean up the town” theme, I came upon an interesting syllabus for a course at Dominican University, The Western: America’s Mythology – books it would be fun to add to my geometrically expanding list of things I would like to read! Meanwhile, I suspect that everyone has personal favorite books and movies in this “swoops in and saves the day” genre. What are some of yours? 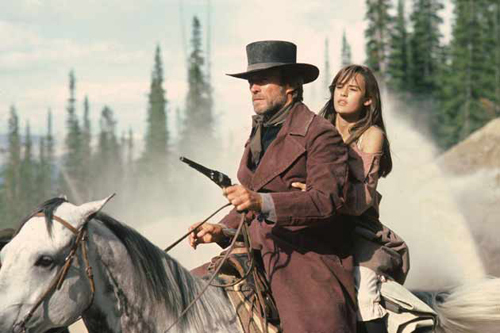 This entry was posted in Article, Books, Movies, Myth and tagged books, Joseph Campbell, movies, Myth, Pale Rider, Robert Jewett, the American monomyth, the monomyth, westerns. Bookmark the permalink. The Iron Giant comes to mind, but it’s a far stretch from what you’ve written about in this post. I’m heading over to Tumblr (first time ever!) to read the piece you’ve linked. Thanks! I’m not familiar with The Iron Giant, but I’ll look it up. Thank you. It’s a children’s story of sorts. But I’ve found that children’s stories tell the best tales sometimes. The book is entitled The Iron Man. The Iron Man was a novel by British author Ted Hughes (renamed The Iron Giant for obvious reasons when made into an animated film). Along with The Magnificent Seven (based on a Japanese original) where the hero is multiplied, it makes me wonder if identifying this type as a specically American Monomyth is mistaken. My favourite subversion of this plot is Bad Day at Black Rock, a ‘modern day’ Western where the stranger riding into town isn’t the saviour but the uncoverer of unwelcome news. Anyway, this post has certainly given me food for thought! Really good point that the samurai movies often follow this pattern. Certainly isn’t exclusive to us, but I do think it was a staple of the early white hat vs. black hat “horse operas.” Even early on, though, you get interesting variations, as in “High Noon,” where “the savior” is so morally stalwart that he saves a town that doesn’t deserve it. Agree absolutely that this trope is particularly prevalent in ckassic Westerns. Perhaps it’s that frontier/backwoods scenario that is part and parcel of US mythology. The late UK writer Colin Wilson made his reputation onThe Outsider, a study of the alienated individual in society as reflected in literature. (I confess I struggled through this in my 20s — must reread it…) European lit focused on the individual (as in Kafka or Camus). In Westerns however it’s often the community that seems alienated from its surroundings, its secrets, with the Outsider (a Jesus figure perhaps?) attempting rescue and sometimes being “the most rejected of men” by the ungrateful or unappreciative community (the Jews in the Gospel narratives?). Anyway, just my random and unformed (even uninformed) thoughts — feel free to contradict me! I’m not going to reject anything, as I think it’s a wide open subject, and there are plenty of examples and counter examples. The idea of an entire community being alienated with secrets reminds me of various scary movie themes – Children of the Corn type plots, as well as westerns. “The government” in that show was usually the sheriff, who meant well but was kind of an Inspector Lestrade character, who needed the wisdom and savvy of the Cartwright boys to do his job properly. Bonanza was part of my childhood too in the UK, along with The Lone Ranger, Wagon Train, Rawhide, The Virginian, Cheyenne &c so I have an inkling of that mentality. Clint Eastwood movies epitomize the heroic outsider for me. That may be generational. Stephen Kings’ Dark Tower series comes to mind, as well. I read one of the later Dark Tower series an enjoyed it very much. Went back to book #1 and got bogged down. Clint seemed to straddle the cusp of the western hero turning to anti-hero, as in High Plains Drifter – if I remember, that’s the one where he saves a town that doesn’t really deserve saving, and makes the townspeople paint it red and change the name to “Hell.” Definitely the end of the Roy Rogers mode! Ah, I think Shane is the best example of the Monomyth in Westerns, although I am not a fan of the movie. I used to teach the book and it is a perfect example. It’s a little book you can read in a day. Make sure you re-read the opening scene after you’ve finished the book so you don’t miss the full circle of the book. I’ll check it out. I remember trying to watch the movie on Turner Classics but not staying to finish it.